Louie Pulls It Out of the Bag!! 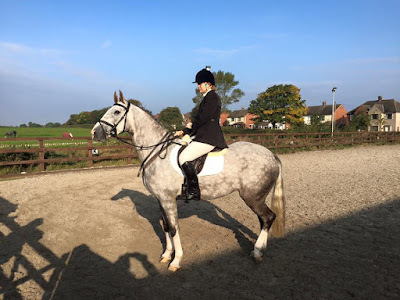 Another dressage update from us this week as we headed off to the dressage on Sunday. Alarm set at 6am (much to Andrew's displeasure! & even I had a grumble about it...) This isn't an early start, but has now become one for us since no longer eventing throughout the summer. Heading to the yard to feed, have a quick brush, load up the wagon, and get going. Times were 9.06am and 9.52am - great times given to us by the organisers at Lane Farm Equestrian!! I collected my number, and headed to the horse box to get changed. Leaving Louie in the horsebox with our partition open, off came his magnetic boots, bandages, tail guard and rug. I always go tacked up still, as it's much easier and makes for a relaxed time when we arrive. Louie went into the warm up no problems, & was lovely and relaxed almost straight away! I was really impressed, but still pleased I'd allowed 15 minutes to walk around before needing to think about working in. He never battered an eyelid over all the poles at the side of the arena, any of the farm equipment, or the passers by through the hedges at one end - & there were other that clearly were!! It was our turn to go in. The test was indoors and Louie was a bit spooky to go in, but with a friendly follow, off he went. He took in his surroundings, and relaxed as he trotted around the main arena, but as soon as we were buzzed in, he wasn't quite so relaxed about being next to the shiny full white boards!! He went tense again, but was listening for direction, so wasn't too terrible, & about half way through he relaxed, and did a lovely second half of his Intro B.
I was pleased, but glad I had entered the second test. I hopped off for 20 minutes, and headed to the ladies, while Louie decided to head for the gents!! That was synchronisation for you! I came down the centre line with a big smile on my face, having really enjoyed riding the test, and being thoroughly pleased with how Louie had gone! I knew it was a much more relaxed test and was overjoyed at how he'd taken comfort from his first to know to relax & continue to listen when he came in again. I couldn't see Louie's test sheet, and certainly in a class of 21 didn't not expect to get placed, but there it was, with a big blue rosette and packet of treats on it!! I was overwhelmed, and felt so proud of Louie. Even better that we didn't realise, we've qualify for the Four Seasons Championship too!! Here's some pics from our test and in between too!